'My aim for patient care is to deliver excellent clinical care in a compassionate and individualized fashion." Ali Rizvi, MD, FACC, FSCIA is a fellow of the American Board of Cardiology and the Society of Cardiovascular Angiography and Interventions. 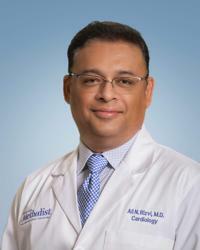 Dr. Rizvi is a board-certified and fellowship trained interventional cardiologist and the Houston Methodist The Woodlands Hospital Heart Program Medical Director.